Indiana University Press, 9780253028983, 256pp. Despite both national and traditional imperatives to have many children, the birthrate of the Jewish community in British Mandate Palestine declined steadily from 1920-1948. During these years Jews were caught in contradictions between political and social objectives, religion, culture, and individual needs. Lilach Rosenberg-Friedman takes a deep and detailed look at these diverse and decisive issues, including births and abortions during this period, the discourse about birthrate, and practical attempts to implement policies to counter the low birthrate. Themes that emerge include the effect of the Holocaust, economics, ethnicity, efforts by public figures to increase birthrate, and the understanding that women in the society were viewed as entirely responsible for procreation. 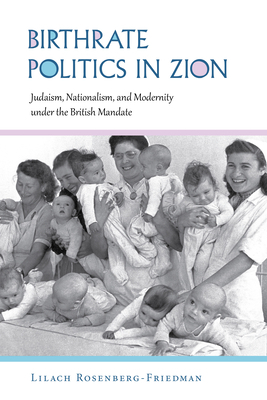 Providing a deep examination of the day-to-day lives of Jewish families in British Mandate Palestine, this book shows how political objectives are not only achieved by political agreements, public debates, and battlefields, but also by the activities of ordinary men, women, and families. Lilach Rosenberg-Friedman is a historian and Associate Professor of the Martin (Szusz) Department of Land of Israel Studies and Archaeology at Bar-Ilan University, Israel.